Generally I am not a big fan of lamb, and when a recipe calls for it I usually sub in beef, but when it comes to sausage lamb is the only way to go. I am of course talking of Merguez Sausage a North African specialty that in my opinion is the pinnacle of ground meat perfection.
. Moncef would often make tons of fresh Merguez for Fourth of July Barbecues, and they were easily my favorite offering amongst the plethora of delicious foods available. Until college I was unsure how widely available Merguez was; and not entirely sure I could get it anywhere other than my uncles kitchen. Luckily for me, and any other food lover though Merguez is readily found at both French and Moroccan Restaurants and at select grocers (like Whole Foods). Today’s recipe for a grilled Merguez Sandwich is a fast, easy, and totally delicious way to enjoy the harissa spiced awesomeness of this sausage. Because Merguez is on the hot side from the use of garlic, fennel, ground chilies, and a few other spices I spread a generous amount of cumin spiced yogurt sauce on one side of a toasted baguette to add a cooling element to the sandwich. Next I layered a salad of diced cucumbers and heirloom tomatoes to add crunch and color to the mix. Finally I topped the veggies with the glorious links of lamb, and because you can never have too much spice finished off the other side of bread with a layer of chili garlic sauce from hoy fong foods (Not authentic but a good substitute for Harissa in a pinch). TADA! Heaven between two slices of bread. If that didn’t excite your taste buds you must simply be naïve to the dazzling wonderfulness of this recipe. But trust me on this one it’s a must try. So run out the door and pick yourself up some lovely lamby sausage, and get your North African / French Culinary groove on. Heat a grill pan to medium heat. Grill the Merguez until cooked through about 5 min per side and remove to a plate once cooked through. Meanwhile dice up the cucumber and tomato and toss together along with a splash of red wine vinegar, season with salt and pepper. Next in a small bowl combine the yogurt with the cumin, lemon juice, and a drizzle of olive; season with salt. Last toast the slices of baguette on the grill or in a toaster until crisp and lightly browned. 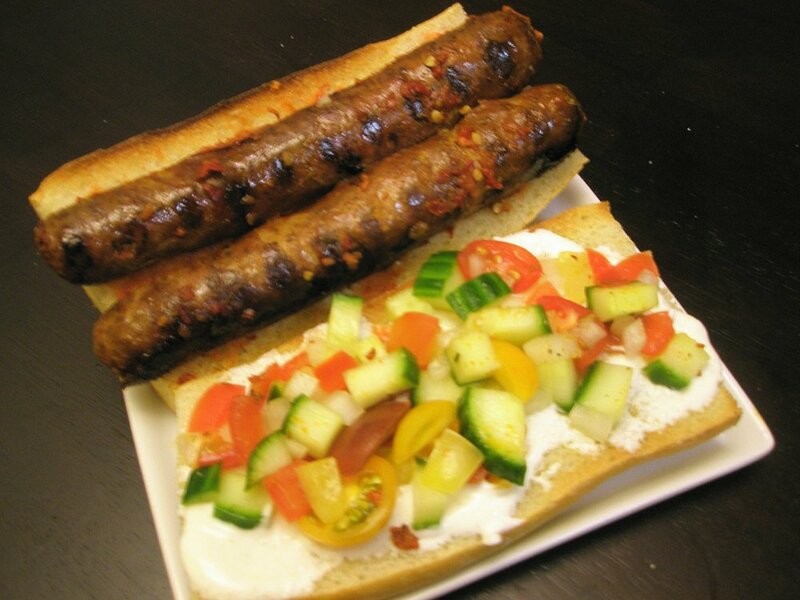 Construct the sandwich by spreading about 2 tablespoons of yogurt sauce on one slice of baguette and a tablespoon of chili sauce on the other slice, top with 1/3 cup cucumber salad and one Merguez sausage that has been sliced into two lengthwise. Finally ready yourself for a delicious explosion of flavor and enjoy. Posted in fast, main dish. 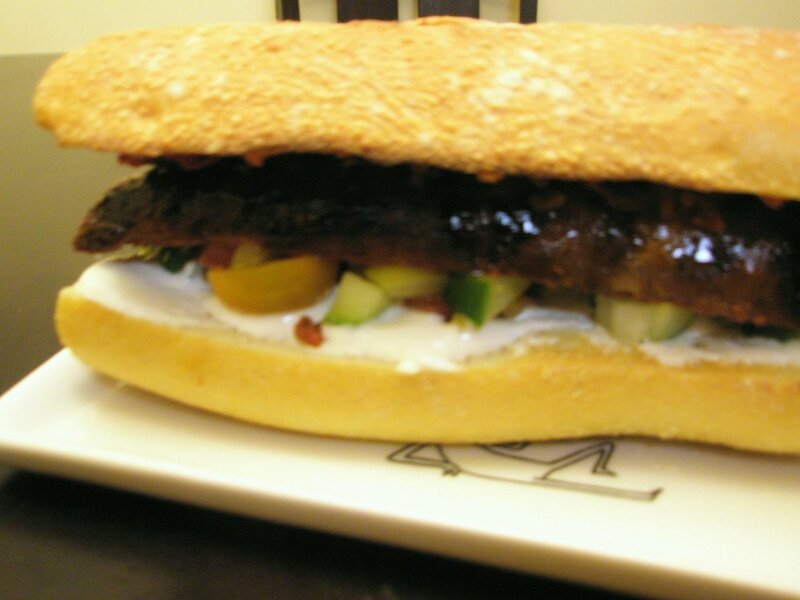 Tagged baguette, cucumber, cumin, harissa, lemon, red wine vinegar, sausage, tomato, yogurt.